The Southern University Human Jukebox is still recovering from the devastating floods that hit Baton Rouge, Louisiana this summer. Many member of the band lost their homes or suffered severe damage to their homes including some of the band directors. The band put on a brave face and started band camp knowing that their community needed them. So they traveled to local shelters and other community events to build up the spirit of those impacted by the flooding. Their efforts didn't go unnoticed. The college band community reached out to Southern University and the LSU Bands to show their love and support to the program. At rehearsal today the band received an extra special gift from a member of the band family, the Ohio State Marching Band. 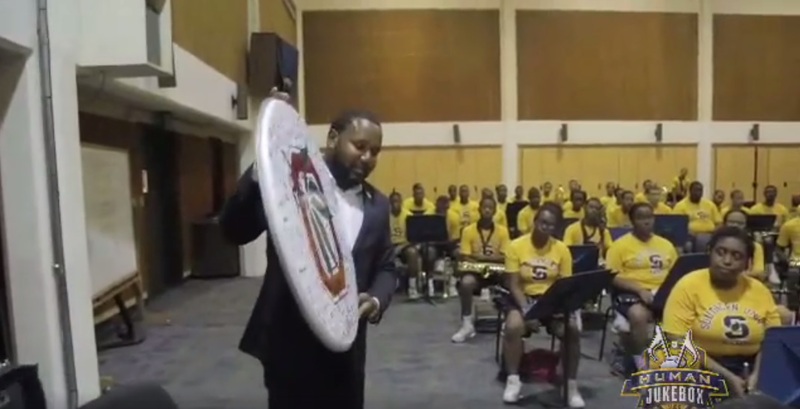 Director Chris Hoch and the entire Ohio State band signed and sent a drum head to the band showing their support along with a personal note to the band. Here's the special moment when the band found out about what Ohio State had sent. The concept of the band family and it's strength is one that we preach often. This is an another amazing example of the band family coming together to support one another in a time of need.